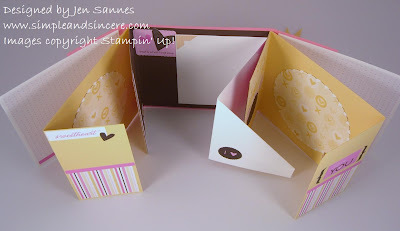 I made this flip book using the Love Sparkles Simply Scrappin' Kit. I will be presenting this as a class at the Rhapsody Art Gallery in Verona on June 27 - see my calendar for more details if you are interested in the class. Contact me ASAP if you would like to attend, as I need to order materials this weekend to make sure they are here in time. The view of the book from the top, showing off all the folds and flaps. These mini scrapbooks are so fun to make! The finished books are 6"x6" and there are tons of places to tuck pictures, a little journaling and memorabilia. I love the fact that the Simply Scrappin' Kits have everything you need to make the flip books - all you need is some adhesive and ribbon. I actually made one for my mom for her birthday, but forgot to take pictures of it before I gave it to her. Trust me, it turned out super cute! And she LOVED it - but it was filled with pictures of my kids, so she would have loved it anyway! :) I am also making one for my son, for his 5th birthday (which is this Saturday - yikes!) 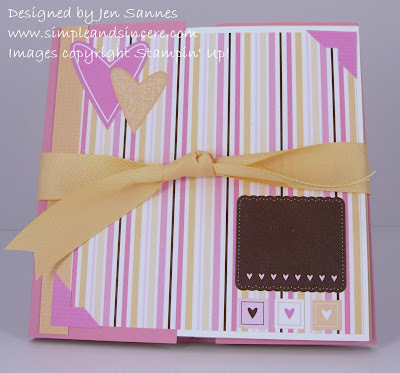 using the Hoppy Memories Simply Scrappin' Kit. I have the book put together and the pages decorated with the self-adhesive die cuts, now I just need to add the pictures. I'll share it with you when I'm finished.